Whilst Britain belatedly introduces a watered-down Climate Bill and other countries tinker and talk about Climate Change, low-lying South Pacific nations such as Kiribati are literally sinking beneath the waves. Kiribati is an archipelago of 33 coral atolls barely 6ft above sea level, and is literally vanishing as sea-temperatures rise. Yesterday, its president, Anote Tong, warned Australia and New Zealand – the two developed countries in the region – to prepare for a mass exodus within the next decade. Speaking at the annual South Pacific Forum in Fiji, Mr Tong said that rising sea levels would create countless environmental refugees. “If we are talking about our island states submerging in 10 years’ time, we simply have to find somewhere else to go,” he said. The archipelago, strung across two million square miles of the Pacific, is home to 92,500 people. Most of them live on the densely populated main atoll, called Tarawa, a U-shaped chain of islets that are surrounding a central lagoon. The beaches on Tarawa, are now so eroded that sand has been imported from Australia. Dozens of families have been forced to move, dismantling their wooden huts piece by piece and reassembling them further back from the water. Now the population is being squeezed into an ever narrower strip of land between the lagoon and the Pacific. There is likely to be a flood of refugees, and migration from South Pacific countries is already underway. About 17,000 islanders applied for residence in New Zealand in the past two years, it said, compared with 4,000 in 2003. Australia’s government has refused to commit itself to taking refugees. Ian Campbell, the Environment Minister, said the focus should be on helping islanders stay in their home countries. While rich nations tinker with policies that may shave their carbon dioxide emissions, low-lying South Pacific nations such as Kiribati are sinking beneath the waves. Kiribati, an archipelago of 33 coral atolls barely 6ft above sea level, is vanishing as global warming sees the oceans rise. Yesterday, its president, Anote Tong, warned Australia and New Zealand – the two developed countries in the region – to prepare for a mass exodus within the next decade. Speaking at the annual South Pacific Forum in Fiji, Mr Tong said that rising sea levels would create countless environmental refugees. “If we are talking about our island states submerging in 10 years’ time, we simply have to find somewhere else to go,” he said. Environmentalists have warned that global warming, caused by a build-up of greenhouse gases, will cause thermal expansion and a meltdown of glaciers. That could lead to seas rising by up to 23ft, and would be devastating for countries such as Bangladesh, India, Vietnam and China. But the tiny nations of the Pacific, where some of the world’s lowest-lying islands are situated, would be the first to be swamped. Those considered particularly vulnerable, as well as Kiribati, are Vanuatu; the Marshall Islands; Tuvalu and parts of Papua New Guinea. In Vanuatu, an entire coastal village on the island of Tegua is being forced to move to higher ground, its huts flooded by surging seas. In Kiribati, too, a former British colony known as the Gilbert Islands, people are having to take drastic action. The archipelago, strung across two million square miles of the Pacific, is home to 92,500 people. Most of them live on the densely populated main atoll, called Tarawa, a U-shaped chain of islets that are surrounding a central lagoon. The beaches on Tarawa, an island nation which is pancake-flat and barely 500 yards wide, are so eroded that sand has been imported from Australia. Dozens of families have been forced to move, dismantling their wooden huts piece by piece and reassembling them further back from the water. Now the population is being squeezed into an ever narrower strip of land between the lagoon and the Pacific. Environmentalists have predicted that the effects of rising sea levels will be borne disproportionately by the world’s most impoverished countries, which make a negligible contribution to global warming and are least well equipped to adapt. An Australian government report this month forecast that global warming in the Asia-Pacific region could see seas rise by up to 19 inches by 2070. 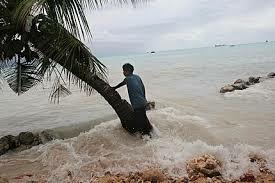 In one nation, Micronesia, according to the report, the sea level has risen 21.4mm every year since 2001. It warned of a flood of refugees, pointing to increased levels of migration already from South Pacific countries. About 17,000 islanders applied for residence in New Zealand in the past two years, it said, compared with 4,000 in 2003. While New Zealand has been generous so far, and has a sizeable Pacific population, accepting large numbers of refugees could risk a political backlash. Australia’s government has refused to commit itself to taking refugees. Ian Campbell, the Environment Minister, said the focus should be on helping islanders stay in their home countries. He added that Australia “has always stood by our Pacific neighbours in times of need and that will never change”. It’s simply frightening beyond words that the lack of political leadership in the world for global climate change is now becoming fully illustrated in the disintegration of the atoll nation Kiribati. It has never been a technical problem — alternatives to dumping 9 billion tons annually of carbon dioxide into the atmosphere could always have been found. (Just wait until the permafrost thaws and the methane is cut loose.) It’s a matter of setting aside the political conflicts and doing what’s best for the planet. Just as the economy is a wholly-owned subsidiary of the environment, human discussion is becoming irrevelant to the progressive weakening of the planet’s health. ACTION is required to prevent further Kiribatis. plz give me any infermation related to environmental refugees. what are the sourses of env.refugees? relation btw environmental & refugees? if any law are there for thei protection? It will only be when large areas of the USA, UK and Europe start to flood and white people are in the front line of Climate Change that we will see any real action from governments. We can all start to make a difference now. Turf off that computer monitor, use your car less, eat local food, don’t fly, turn down your heating and don’t use air conditioning and that would make a difference…. white people have nothing to do with this ray, it is the superpower countries in general and industrialized counties we need to point the fingers at. governments are the ones who must take action because its citizens cannot take all the work on themselfs, it just wont happen. laws must be enforced, and counties must make new laws to keep green house gase increases to a minimum. So then what, you suggest unless the governments change the people should do nothing at all and just do “business as usual”?! That’s bad. Then that’ll only make the governments more rooted — we’ve got people who don’t want to make changes themselves plus governments who don’t want to make changes and that equals, well, no changes. We should not wait until governmental leadership comes to make changes to ourselves especially considering it’s lack does not prevent us from being able to make such changes. Maybe the people cannot do ALL the work, but that’s irrelevant and you know it: they must do as much as possible. Eventually then as the “old dogs” who are _in_ the governments terms expire they will be replaced by new people who do things differently and, you guessed it, the government changes… One should not ever, ever find an excuse for “business as usual”… One may point the finger at the government but remember that you have 3 fingers pointing back at YOU, and that means YOU have got to change TOO, not use this as an excuse for business as usual.